From the Archive: A British Television Blog: A Family Guy Christmas! It is that time of year when I randomly pick anything to watch for this blog during December, it will be something to do with Christmas. 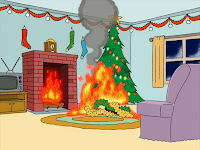 Now although this blog is predominantly associated with British television, I break away from that this week to watch a Christmas themed episode of Family Guy. I was planning on watching two Christmas themed episodes of Family Guy but there is an issue with that which I will go into a little bit further down in this article. I love episodes of TV series that have unnecessarily long names such as this one A Very Special Family Guy Freakin' Christmas. It’s not that I don’t like them; I just prefer not to type them. The story is simple; everyone around Lois is either incompetent or selfish. She had put up with a lot from her family. Peter gives away all the family gifts to Toys for Toddlers instead of the one gift that was designated for them. 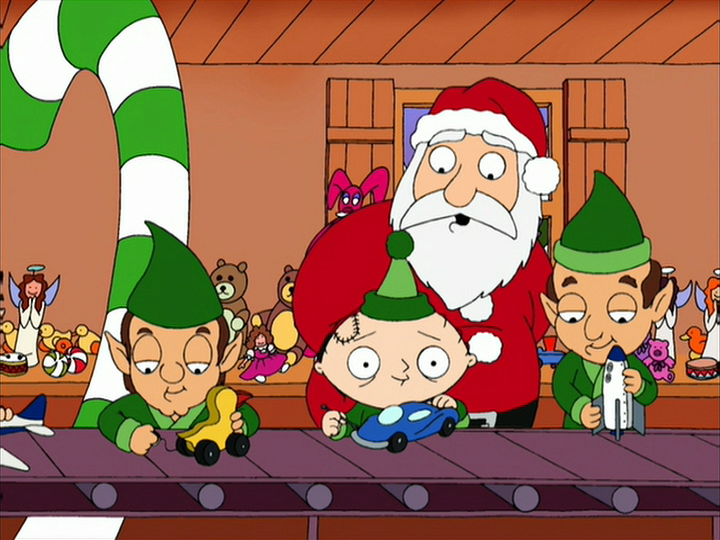 Stewie doesn’t want to play baby Jesus at the nativity pageant. Brian nearly burns down the house after he sets a fire in the rarely seen living room fireplace. Though, it wasn’t Brian’s fault, he was all set to put out the fire with the fire extinguisher but unfortunately, it was the prank extinguisher Peter bought. 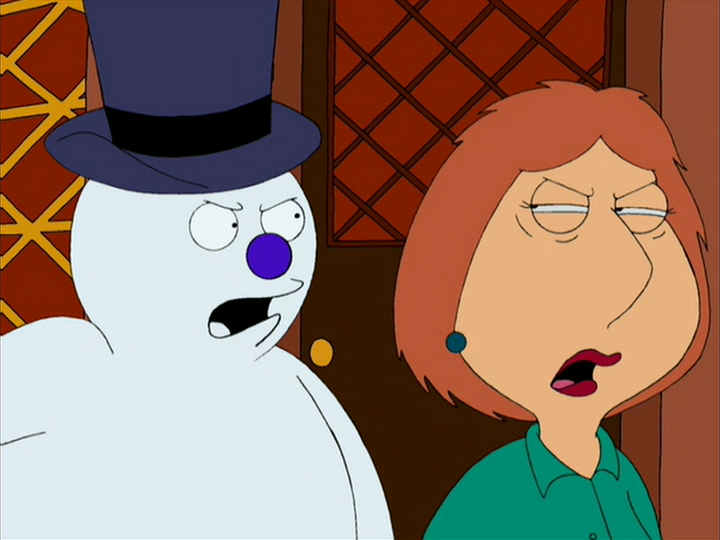 The whole time, Lois has been very forgiving. She is still blessed with the joy of Christmas. Even coming home, she is understanding and blessed that although her house is a mess from the fire, Brian is alright. This is until she snaps! Lois asks Meg for a paper towel to help clean up the mess and then goes into a rage when she is told there are no more paper towels. She violently leaves the house via the window. It takes the family tracking her down at town square where Peter knows that she wants to rip down the star at the top of the giant Christmas tree. 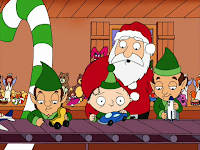 Finally, to help coax Lois down from the tree, Peter and the family start the pageant with Stewie as baby Jesus that Lois, all the way at the top of the screen, tears up in happiness. She doesn’t tear up quick enough to avoid being shot by a tranquilizer gun to get her down. Everyone has a happy Christmas including Stewie who gets what he wants: plutonium. He made a deal with Santa to be nice to get what he wants. He believes Santa may be watching him from an ornament on the tree. It is interesting to me that in this episode Lois has to almost force Peter to hang out with Joe, Peter’s handicapped next door neighbor. As the series goes on, Joe is one of Peter’s closest friends but here, he want hardly anything to do with him. In earlier episodes they seem like friends, it is a very interesting dynamic to the episode. Makes me wonder if this was written or even produced earlier before they decided Joe was going to be a close friend? To be honest, I don’t remember when Joe became part of the group so I may be talking complete crap. They may have been best friends from episode 2 onwards but I don’t remember. There are some nice little pieces to this episode. My favorite is the little bits and pieces on different TV sets Peter watches throughout this episode which was the holiday special KISS Saves Santa. Obviously a take-off from KISS Meets the Phantom of the Park, this episode has all four members of KISS doing voice over guess appearances. 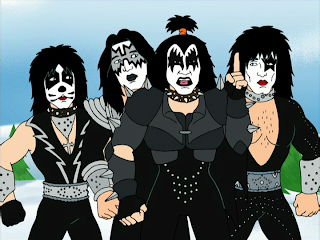 It is stuff like that I love and this is where Family Guy excels. If you are able to get most of the pop culture references, this series is great. It is clear that Seth MacFarlane and everyone who works on the series loves that sort of thing and they are great at weaving that into the episodes. It makes me wonder what they are going to do with The Flintstones. The line "I'm the virgin Mary; that's my story and I'm sticking to it" to "I'm the virgin Mary". The reflection of Stewie's buttocks on the ornament. The line the boy in the trailer park remarks about the VCR being named "Sony". Brian's statement after shooting the snakes out of the novelty fire extinguisher. This episode is found on the Volume Two Disc 2 set and because these episodes are so short, I decided to treat myself to watching all the episodes on the disc. Watching these episodes are bight size morsels of joy. They are always funny and never disappoint. These episodes are the last few before the show was cancelled in 2002. I know a few friends who loves Family Guy but refuses to watch any episodes of the series that were made before the cancellation. If it is post 2005 for them, no problem. I can kind of see that as I am a huge fan of The Simpsons yet I deplore the first season. If I can avoid it, I will not watch any episodes from that season. I think those episodes are crude and are so far off the mark from where they ended up that watching them are embarrassing. Though, I think this is different with Family Guy. Family Guy got itself settled almost from the start. This is especially true with the batch of episodes I watched. If anything, Peter is slightly (and I mean slightly) more father-like. I don’t think I watched a single episode where Peter farted in Meg’s face. Some were really funny but one that I think stood out for me was Emission Impossible. Peter and Lois want to have another baby and Stewie will go out of his way to stop it. 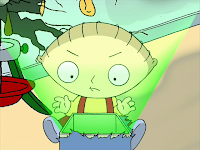 What I love about Stewie is all of the technology he builds but he is still a child and always needs the help of Lois. In the episode he builds this ship that can shrink itself down small enough where he can enter Peter (that’s right) to get to his testicles to destroy all of his sperm, thus stopping him from impregnating Lois. There he meets his future nemesis, Bertram. 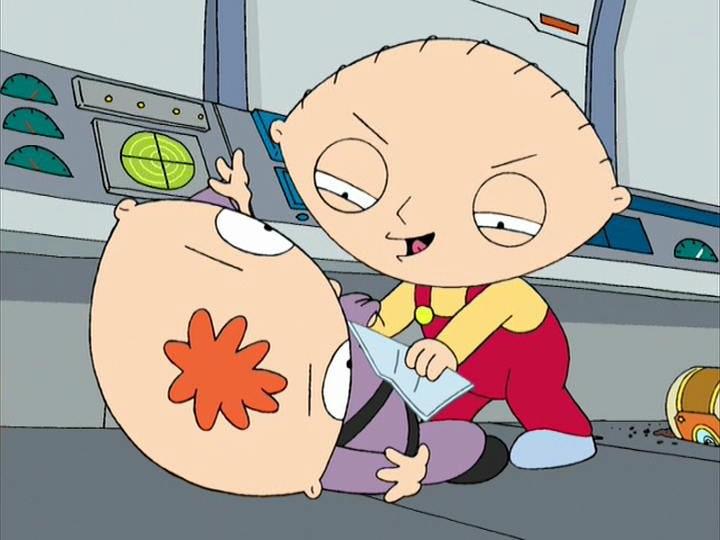 Bertram is virtually the same as Stewie. He is brilliant like Stewie. They have a great fight sequence. Finally, Stewie realizes that Bertram, if conceived and born, could be beneficial in Stewie’s life because they share a hatred for Lois. The best part of the episode is that the voice of the computer on Stewie’s ship is Majel Barrett. Magel was the voice of all the Federation ships in the Star Trek films and Star Trek: The Next Generation. She has been gone for three years and she is sadly missed. Earlier in this article, I said I was planning on watching two Christmas themed episodes. Not only A Very Special Family Guy Freakin' Christmas but I was hoping to watch the 2010 episode Road to the North Pole. This was a 60 minute episode and it is commercially available to buy so what is my problem? The problem is that this episode was transmitted in HD and the only thing available is a DVD of that first part of the season. I could go to iTunes and purchase the HD version of the episode but I don’t want that. I am old fashioned and like to physically own this media. The two Star Wars parodies, Something, Something, Something, Dark Side and It’s a Trap! were both made in HD and released on Blu Ray. Why is this newest set, Volume Nine, not on Blu Ray? Is it perhaps because the episodes that are on the set are a mix of SD and HD material? To me, that is no reason. The Simpsons Season 20 Blu Ray set included SD episodes on the HD set. They up res the episodes to be on Blu Ray and they look fine. Well, maybe that is because The Simpsons are released by a different company than Family Guy? No, they are both released by FOX so that is not a reason for decision either. Has anyone heard the reason for this? 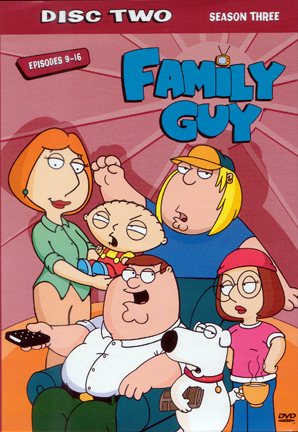 Please release HD Family Guy episodes in HD! I have a personal rule for myself when buying DVD or Blu Ray. If something is made in SD, I am OK with picking it up on DVD. It still looks good on my HD set. Especially most of the British television I have is shot on SD video from the 1970s and 1980s. It won’t look that much better on Blu Ray. But, if a series was made in HD, I want to buy it on Blu Ray. It’s not like Family Guy isn’t popular and would make money. It makes me wonder if they are planning to release it twice. Regardless, I only plan on buying it once. 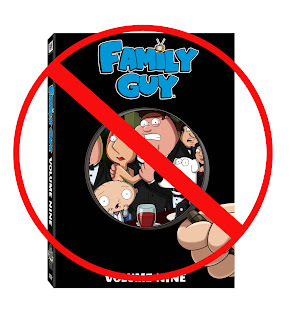 Sadly, it looks like I won’t be buying any further volumes of Family Guy until they change their mind on their release policy. Next week: Going back to British television in our Christmas month. To me, celebrating Christmas always conjures up images of Victorian London and that is exactly where we are going next week. We will take a look at The Adventures of Sherlock Holmes with Jeremy Brett. We will be looking at The Blue Carbuncle. Happy Holidays from From the Archive! 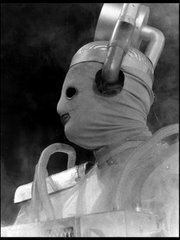 Missing episodes of Doctor Who found!